With this unique Eyjafjallajökull-DNA model, RJ illustrates the legends of our time and the mythologies that will forge the memory of the 21st century. 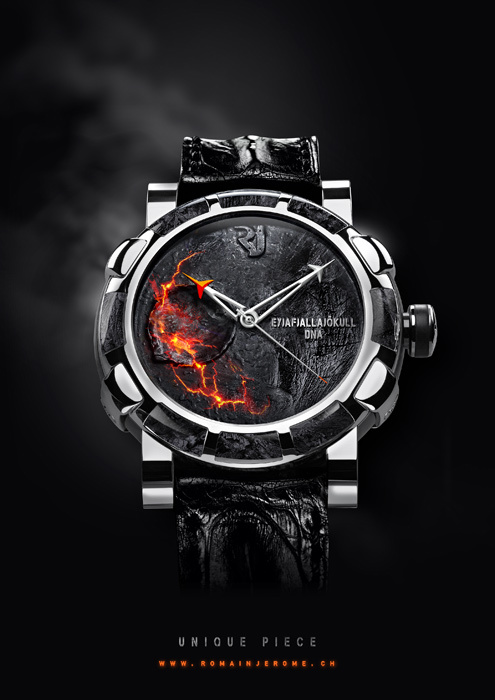 A timepiece with its finger on the pulse of the latest events, designed with ash from the erupting Eyjafjallajökull which is establishing itself as one of the most intimate symbols of our global contemporary emotions. 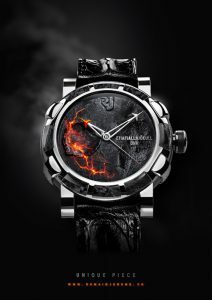 As if revealed beneath the dial through a bold stylistic effect and ready to burst forth at any moment, the lava ejected from the core of the planet illustrates an inner strength capable of setting fire to time – in this case held captive by a steel bezel and volcanic ash. Conveying memories of fire and lava, swept over by powerful images of dust and winds, and testifying to primeval energies as well as human vulnerability, the rough, brutal, fissured dial is crafted from ash ejected by the Eyjafjallajökull volcano. Above and beyond the words and pictures heard and seen over and over again on our TV and computer screens, the visual impact of this form of telluric inevitability serves as a fresh reminder of the inherent vulnerability of our world view. Behind the ash cloud lies the vanity of our philosophies of time. This one-of-a-kind model is accompanied by a certificate of authenticity confirming that the volcanic rock and the ash do indeed come from the Eyjafjalljökull volcano.